J2a3d haplogroup (formerly known as J2a4d, J2a1e, J2a1h, J2l, and more recently by some, J2a1d) is rare. It is small enough that the big picture can be seen when looking at the results available. Within this rare group, there are clusters of people that are more closely related than others within the group. 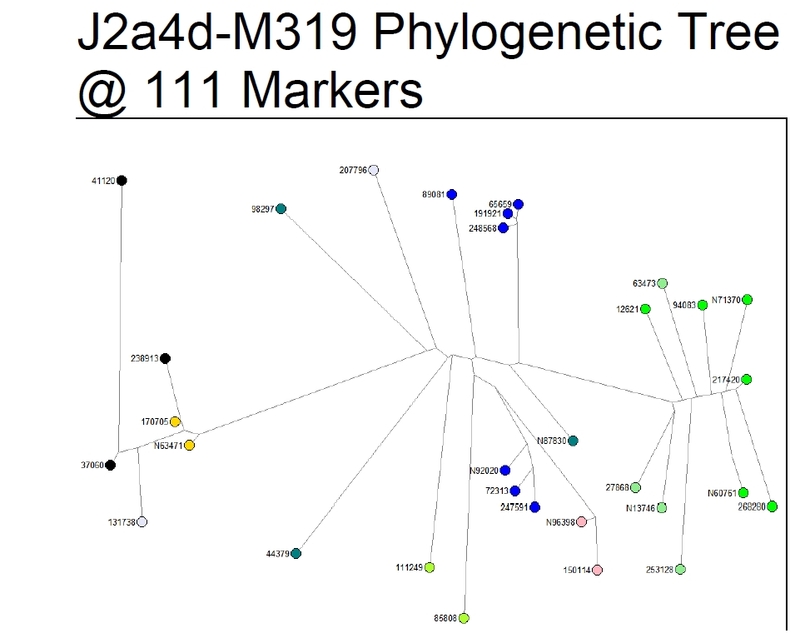 The classification changes periodically, and some old classifications are used by the likes of 23andme and other testing companies, some being more out of date than others, but the haplgroup itself remains defined by the SNP M-319 (Map Single nucleotide polymorphism) regardless of what it is called. In other words, they are all the same so long as you are SNP M319 positive. Note, the above picture will be updated shortly to reflect the recent change in name from J2a3d to J2a1d. This site has a section dedicated to this haplogroup, and this is the homepage for this haplogroup on this site. You are free to explore the rest of the site if you wish - it is about the Langton family, some of which are J2a1d. All J2a1d articles on this site are linked to this page, as well as any information on other sites on the internet that we can find about J2a1d. We hope this will become a central resource for all us J2a1d people. If you know of something that is missing, then please get in contact with us via the "Contact Us" link above, so that we can add it. We would also encourage you to speak up if you think any of our theories or analysis is wrong. We won’t be offended. Our sole aim is to understand the haplogroup better and by challenging the hypotheses we come up with, we can only improve our knowledge and understanding of the group. Y chromosome haplogroups are designated by the International Society of Genetic Genealogy (ISOGG) and this is the J Haplogroup tree for 2012. Note, that these classifications do change over time, which is why J2a1d used to be called other things in the past. The short of it is, don’t get too attached to J2a1d because it might be called something else next year, or even later this year! The ISOGG tree is based upon the nomenclature designated by The Y Chromosome Consortium (YCC), a scholarship group of scientists involved in a collaborative study of genetic variation of the human Y-chromosome. Most often, it is the YCC nomenclature that is used in science publications. The nomenclature is not so important, so long as you understand that they are all talking about the same thing - SNP M319. The nomenclature may change, but SNP 319 will not. Due to the rarity of our haplogroup, M319 does not get much attention by the scientific community, but we will collect any links to any published research on the group on a seperate page click here to reach it. While our M319 group does not get much official research by the scientific community, we are leading the way with research into the group. If you are M319 positive then you are a major stakeholder in this effort with us, so please get involved as best you can. There are two ways that you might have discovered that you are J2a1d. One is through a Y chromosome test (Paternity or Ancestral) with a company like familytreedna or ancestry. The other is through a company like 23andme that specialize in medical dna data, but who also provides some ancestral data. The latter are able to determine your haplogroup without providing all the same sort of data you get with a purely ancestral based test through a company like FTDNA or Ancestry. Both are fine for determining if you are J2a1d, but only the ancestral tests will enable you to compare with other people in the haplogroup to see which cluster within J2a1d you belong in. If you haven’t yet done an ancestral Y chromosome test, but are thinking about it, then this article will tell you more about the tests, which companies provide them and provides a cost comparison. If you are not sure if you are SNP M319+ then ask and we will help you check. Here is an article looking at the origins of J2a1d. The Semargl site is one of the best resources for a list of other J2a3d test results. You can submit your results and get added to see where you fit genetically in the list. Here is a phylogentic tree of J2a1d (created when the haplogoup was called J2a3d) and its place within the upstream J2 haplogroup. Clicking on the photo will open up a new window where a PDF file will open. The PDF file will display this and several other related charts. Thank you to John S Walden for the creation of these charts! 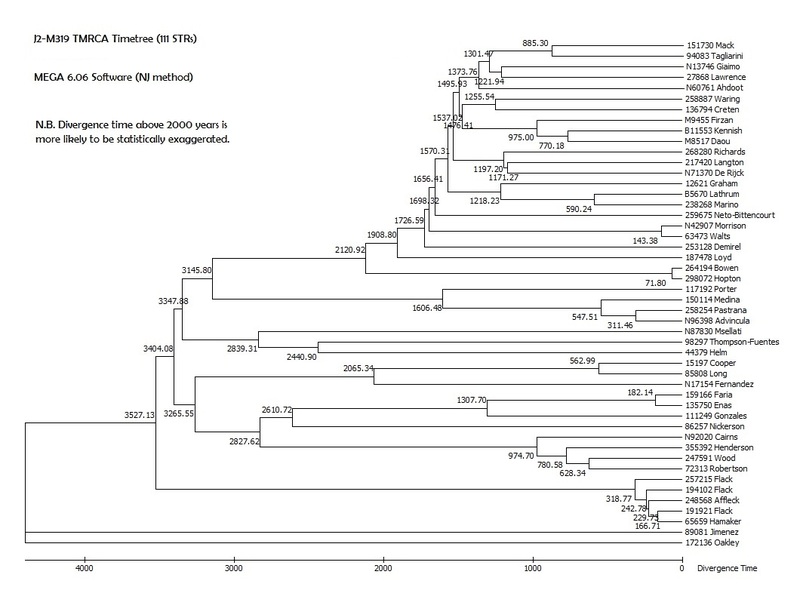 This, below, is a timetree of the group (again based on 111 marker data) which shows the branches of the tree according to the data and with timescales to show the timeperiods in which mutations which define the different groups, took place.